This image is derived from a photograph published in the September 17, 1909, Indianapolis News. 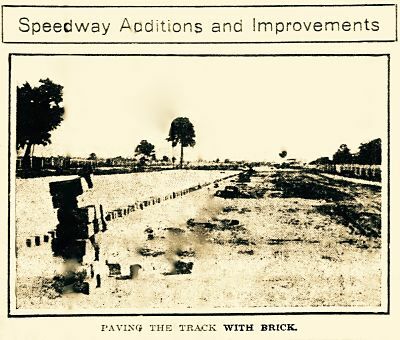 This photo is of the setting as work began to pave the Indianapolis Motor Speedway with bricks. Reportedly the work began the previous day on September 16. The project manager was Park Taliaferro "P.T." Andrews, the engineer who designed the original configuration and led the construction of the Speedway. The process began with the selection of paving material and in addition to bricks, cement and even creosote wood blocks were considered. The contract to supply the bricks was won by the Wabash Clay Factory which hired 200 temporary workers and subcontracted with other brick suppliers to meet the order for 3.5 million units. The project had the attention of not just the racing community but also leaders of municipalities around the country and overseas. This was an era when communities were struggling to meet the need for improved roads as a direct result of the popularization of the automobiles. The National Paving Brick Manufacturers Association provided consultants to not only ensure top quality work but also learn from the process. 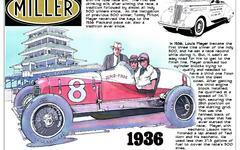 The project was triggered by the tragic events of the Speedway's first auto race meet where five men, including two spectators, who were killed in racing accidents. Speedway management not only predicted faster speeds but greater safety with a hard, durable surface where pounding tires could not dig ruts. Track officials had to present responsible behavior as others challenged the safety of the sport including Indiana's Lieutenant Governor who called for it to be banned.